Some Bitcoin casinos just stick with what they have for a long time, while others always try to keep things fresh for their players. Bitcasino.io definitely belongs to the latter category, continuously trying to grow its brand via player promotions. Namely, if you’re looking for a new slot tournament to enroll in, Bitcasino will give you the chance to sign up and win up to €2,000 in BTC until next weekend. So read on and jump in! The new slot promotion is being offered by the casino to market the newly added Disco Double slot from iSoft Bet and you can even win a special Mega prize outside of the regular tournament pool. The promotion began on September 28th and it will run until next Wednesday, October 4th, 23:59 GMT. During the tournament, all you have to do is play the Disco Double slot game and you will automatically be entered into the raffle. For every €1 in BTC you wager at the slot during the specified period, you will receive 5 points for climbing up the ladder. You will also get a chance to double your points by getting 2 Disco Double symbols on the first 3 reels in the slot game. The prizes at the tournament will be given to the top 25 players based on the total number of points they’ve gathered through wagering or doubling their points. The top 4 players will be able to get the most money, with the 1st prize being €2,000, the 2nd €1,000, the 3rd €400, and the 4th €250 in Bitcoin equivalent. Places 5 to 10 will also get rewarded with a €100 worth of Bitcoin each, and so will places 11 to 25 but with €50 worth of Bitcoin instead. The casino will update the Leaderboard on a daily basis so you can see how far you’ve progressed during your last round. And in addition to the 25 default prizes, there will also be a Mega Prize of €5,000 in Bitcoin equivalent, which will be given in a special raffle. To participate in this raffle, you will have to earn 5,000 points or more during the promotion. The winners for this raffle and the tournament itself will be contacted by the casino by October 6th at the latest. 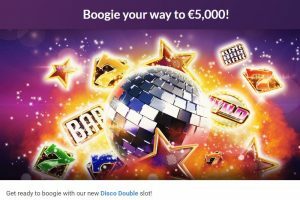 The Disco Double slot promotion isn’t a rare case of the casino marketing a Bitcoin slot game with rewards. Namely, ever since the casino gave its platform a face-lift it has been organizing slot tournaments almost every week. Last week, it was the Fairy Gate slot promotion that gave out rewards a week before Vegas Casino, while before that Bitcasino also featured promotions for the Wolf Cub slot from NetEnt and the King Panda from Booming Games. The casino also has regular end-of-the-month promotions available where you’d get 3 days to play slots and table games on your phone and win a 250 mBTC prize. If you are interested in entering the tournament or checking out the casino’s game offer and other promotions, feel free to give the site a visit via this link here.